An analysis that would have taken more than a thousand years on a single computer has found within one year more than a dozen new rapidly rotating neutron stars in data from the Fermi gamma-ray space telescope. With computing power donated by volunteers from all over the world an international team led by researchers at the Max Planck Institute for Gravitational Physics in Hannover, Germany, searched for tell-tale periodicities in 118 Fermi sources of unknown nature. In 13 they discovered a rotating neutron star at the heart of the source. While these all are – astronomically speaking – young with ages between tens and hundreds of thousands of years, two are spinning surprisingly slow – slower than any other known gamma-ray pulsar. Another discovery experienced a "glitch", a sudden change of unknown origin in its otherwise regular rotation. "We discovered so many new pulsars for three main reasons: the huge computing power provided by Einstein@Home; our invention of novel and more efficient search methods; and the use of newly-improved Fermi-LAT data. These together provided unprecedented sensitivity for our large survey of more than 100 Fermi catalog sources," says Dr. Colin Clark, lead author of the paper now published in The Astrophysical Journal. Finding these periodic pulsations from gamma-ray pulsars is very difficult. On average only 10 photons per day are detected from a typical pulsar by the Large Area Telescope (LAT) onboard the Fermi spacecraft. To detect periodicities, years of data must be analyzed, during which the pulsar might rotate billions of times. For each photon one must determine exactly when during a single split-second rotation it was emitted. This requires searching over years long data sets with very fine resolution in order not to miss a signal. The computing power required for these "blind searches" – when little to no information about the pulsar is known beforehand – is enormous. Enlisting the help of tens of thousands of volunteers from all around world donating idle compute cycles on their tens of thousands of computers at home, the team was able to conduct a large-scale survey with the distributed computing project Einstein@Home. In total this search required about 10,000 years of CPU core time. It would have taken more than one thousand years on a single household computer. On Einstein@Home it finished within one year – even though it only used part of the project's resources. 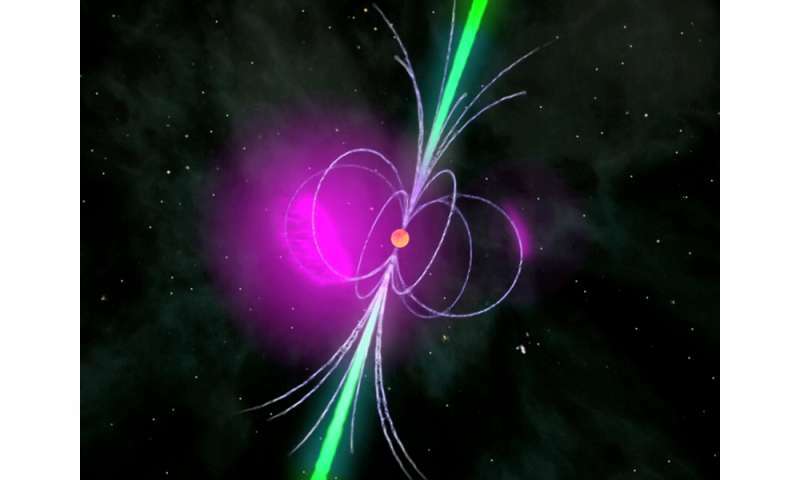 The scientists selected their targets from 1000 unidentified sources in the Fermi-LAT Third Source Catalog by their gamma-ray energy distribution as the most "pulsar-like" objects. For each of the 118 selected sources, they used novel, highly efficient methods to analyze the detected gamma-ray photons for hidden periodicities. 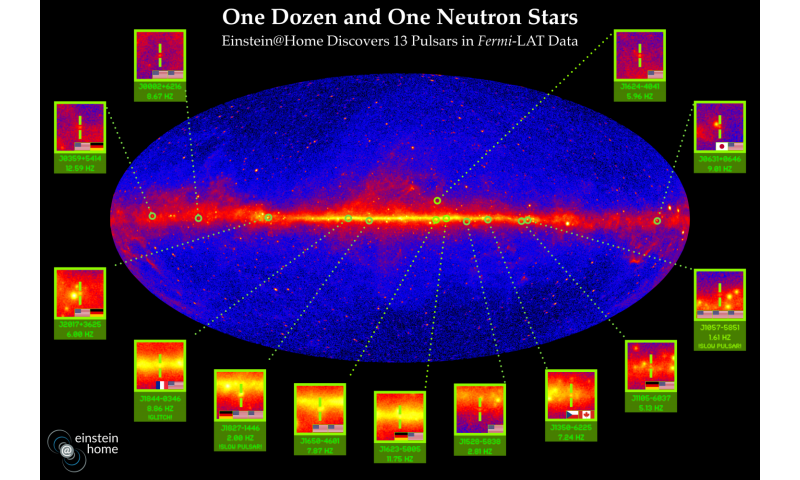 "So far we've identified 17 new pulsars among the 118 gamma-ray sources we searched with Einstein@Home. The latest publication in The Astrophysical Journal presents 13 of these discoveries," says Clark. "We knew that there had to be several unidentified pulsars in the Fermi data, but it's always very exciting to actually detect one of them and at the same time it's very satisfying to understand what its properties are." About half of the discoveries would have been missed in previous Einstein@Home surveys, but the novel improved methods made the difference. Most of the discoveries were what the scientists expected: gamma-ray pulsars that are relatively young and were born in supernovae some tens to hundreds of thousands of years ago. Two of them however spin slower than any other gamma-ray pulsar known. Slow-spinning young pulsars on average emit less gamma-rays than faster-spinning ones. Finding these fainter objects is therefore useful to explore the entire gamma-ray pulsar population. Another newly discovered pulsar experienced a strong "glitch", a sudden speedup of unknown origin in its otherwise regular rotation. Glitches are observed in other young pulsars and might be related to re-arrangements of the neutron star interior but are not well understood. "Einstein@Home searched through 118 unidentified pulsar-like sources from the Fermi-LAT Catalog," says Prof. Dr. Bruce Allen, director of Einstein@Home and director at the Max Planck Institute for Gravitational Physics in Hanover. "Colin has shown that 17 of these are indeed pulsars, and I would bet that many of the remaining 101 are also pulsars, but in binary systems, where we lack sensitivity. In the future, using improved methods, Einstein@Home is going to chase after those as well, and I am optimistic that we will find at least some of them."